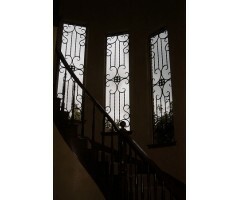 These iron window grills complete this beautiful staircase - reminding me of my visits to Europe when I see this. .. The ivory tone on the interior and exterior of these kitchen cabinets is perfect to accentuate the beauty of the custom ironwork inserts and really make this kitchen "pop" with elegance and style. .. 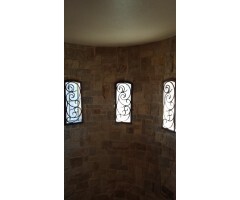 The beauty of these custom iron window grills are beautiful from the outside of this home, but can you imagine the impact and beauty from the inside! .. 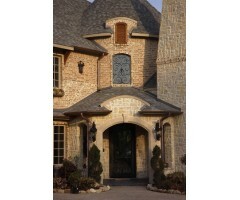 This luxury home with it's attention to architectural detail puts on the finishing touch with the custom iron "pendant" window grill front and center. 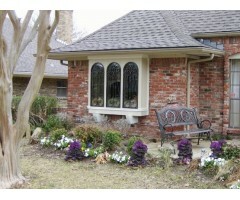 ..
Three arched dormer windows on this home are a visual delight with the custom iron window grills complimenting the ironwork on the front entry door. .. This storybook luxury home with a full turret and Juliet balcony wouldn't be complete without the European styling with wrought iron curved balcony and window grills to create the "perfect" dream. .. 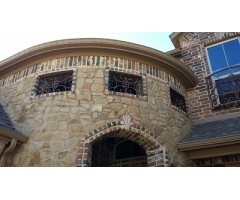 This estate home's turret was finished with customary wrought iron window grills to complete it's majestic appeal. .. 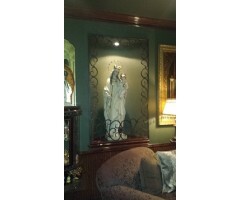 This treasured masterpiece was framed with elegance behind this custom scrollwork completed with center medallian. .. 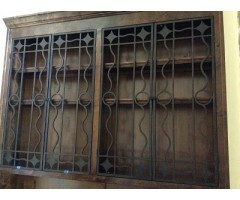 True craftsman style in design, this custom iron window grill was built for a large display cabinet. ..